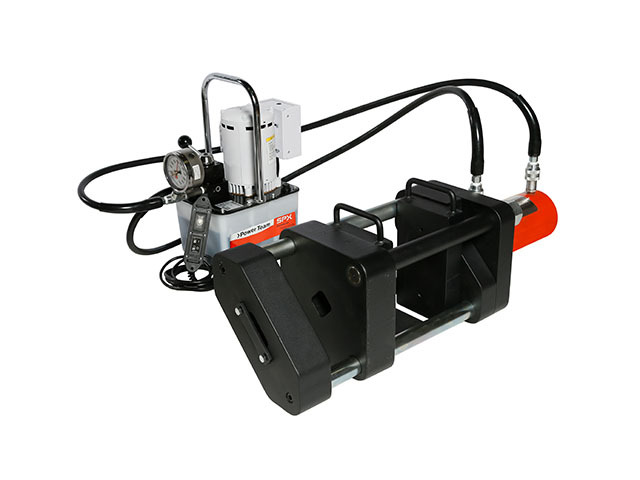 The Fillet Weld Tester is a new device added to Sawyer’s line of weld inspection and tensile testing equipment. In creating this tester, Sawyer redesigned its 50-Ton Tensile Tester to perform fillet weld testing along with all its original capabilities. It’s a 50-Ton Tensile Tester with specific capabilities for testing fillet welds, which leads to increased safety for the operator. This increased safety is due to the ability to test fillet welds without the use of a press that is not specifically designed to perform such a test and can lead to accidents..
Welding schools perform these types of tests all the time, but they typically use a press to complete the break test or other unsafe methods. Our Fillet Weld Tester removes those dangerous variables and introduces a safe, repeatable testing method that meets the most stringent standard for accuracy and dependability. In addition to the 50-Ton Tester’s lengthy list of standard attributes, which includes a liquid-filled indicator gauge, pulling jaws, steel carrying case, and 3/8-inch ASME die and plunger set, this tester also includes removable plates for performing fillet weld tests and an electric pump. The 50-Ton Tester’s ability to safely perform guided bend and pull testing with a high level of mobility and versatility was already impressive, but now this piece of equipment introduces an element of testing ability that many educational welding facilities will find helpful.